Wellies galore from Best In The Country are listed here, and from some of the top brands including Hunter, Aigle, Le Chameau, Dunlop and Stormwells. This section includes 'standard' wellies - but that doesn't mean they aren't special boots! By 'standard' we mean that the wellies in this section do not have any integral insulation, or other unusual features. These are boots that are just lined with cotton or nylon and includes all the biggest sellers that we stock. This includes the legendary Hunter wellies such as the Hunter Original and the Hunter Gloss - demand for these styles has outstripped the supply for the last two years. An uninsulated welly is perfect for use in the spring, summer and early autumn. In the winter, you will find you get cold feet unless you wear extra warm socks or footlets. If you choose Hunter wellies, you can get coordinating fleece welly socks that are designed to fit their range of boots. 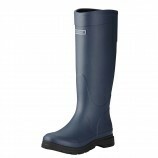 If the weather is really, really cold you may want to consider our range of neoprene wellingtons.